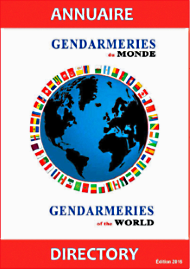 The French National Society for the history and heritage of the gendarmerie has just issued a “Gendarmeries of the world Directory”. 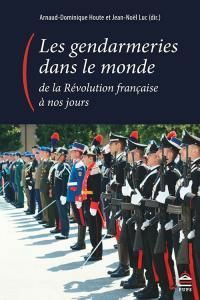 Written both in French and in English, this exceptional work gathers all the characteristics of 45 gendarmeries or alike forces existing in the world. Conceived for private individuals, French administrations and foreign institutions, international organizations and private companies, it is aimed at all those who, for diverse motives, are interested in internal security questions in several countries of the world. About fifty countries in the world adopt the Gendarmerie type of public police force system today. Whatever they are called Gendarmeries, Carabiniere, Constabularies, Troops, etc., all these forces possess in common specific characteristics, which differentiate them from others internal security systems. The main is attached to their military character, which determines as well their hierarchical organization as their staffs’ status, their modes of action or their equipment. Far from disappearing, this internal security system is in full development as evidenced by the re-creations of gendarmeries in some Eastern Europe countries at the end of the XXth century or even the recent creation of new gendarmerie-type forces, such as the Qatari Internal security Force in 2003, the Jordanian Gendarmerie in 2008, or the Mexican Gendarmerie, in 2014. The emergence of new threats, obviously the terrorism, but also internal disorders and serious crime development certainly explain the choice of this force system, which intervention capacities in crisis situation are not to be demonstrated any more. World premiere, this reference document is to be hold by all those who are interested in the Gendarmerie system which exists in more than 45 countries in the world. It is available here, either in the form of a book, either directly through online consultation. It echoes another book, published (in French) a few months ago, entitled “Les gendarmeries dans le monde, de la Révolution française à nos jours”, which you can order here.